Last weekend my husband and I went to see Arthur Miller's A View From the Bridge at the Ahmanson theater in downtown Los Angeles. 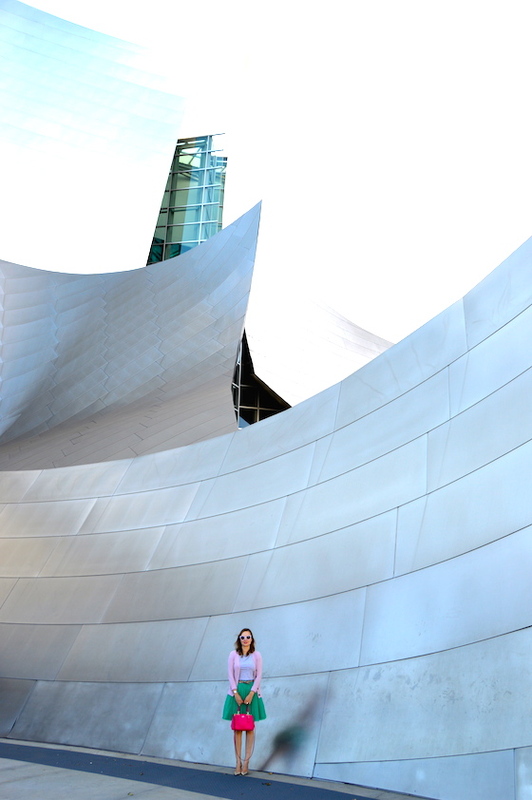 On Sunday afternoon, DTLA is quite abuzz with people experiencing the arts, be it to go see a concert at Walt Disney Hall, gander at the impressive contemporary art collection housed at the Broad Museum, or, like us, take in a play at one of the two theaters on Grand Avenue. The landscape of this part of town has definitely changed quite a bit since I first moved to Los Angeles in college, thanks to the addition of the aforementioned Broad and the spectacular silver behemoth that is Disney Hall. Love or hate these contemporary buildings, one thing is for sure: they do make for great backdrops for photos! For our Sunday matinee, I decided to wear my new tulle skirt from ASOS. Truth be told, my tulle collection is growing by leaps and bounds. Tulle is not a very practical fabric and it's definitely not for everyday use, but that doesn't stop me from buying more! I liked this particular skirt because of the color and the length is just perfect! In addition to hoarding tulle skirts, I've also been capitalizing on the clearance section of the girl's department at Target. That's right, the girl's department, as in clothing for kids. Not everything fits me in this department, though. For example, skirts and pants are way too short, but the tops are often just perfect! Last week, Target put a bunch of tees, like this fun dot one, on clearance for about $4, so I stocked up big time! The prints are always so colorful and fun compared to the ladies department and you can't beat the price! Love this! The hot pink with the green is so cute together! I love that you paired it with a t shirt for a totally "cool" vibe! Always able to pull off colorful outfits! You are so chic! And these colors are so refreshing! Beautiful! Beautiful tulle skirt! I really like how it is fuller than many of the ones I have seen and the color is great. Thanks for the tip on the Target girl's department. I never would have thought of it. Super adorable! Happy Friday, Katie! You know I love this outfit. I featured it on Thursday Moda a couple of weeks ago. The skirt is beautiful and would be perfect for upcoming Christmas and I need that adorable little girls' tee.